Custom made to your very own specifications because your wedding is special and so are your Bridesmaids, Flower girls, Matron of Honour, Mothers, and guests! 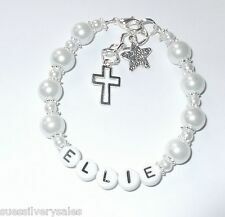 Carefully made using good quality products, this gorgeous bracelet is made up using long lasting letter beads, silver daisy spacers and two sized glass pearls. 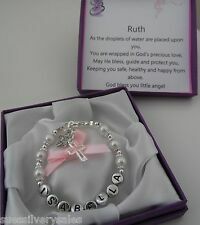 The gift box is personalised with the shown verse or with wording of your choice, this is printed in the box lid. Orders left with no size will be made to the default size of 5.5" suitable from birth to 2-year-olds. Supplied in a pink box & pink border as standard for girls, silver box & blue border for boys. TO AVOID ANY DELAYS IN PROCESSING YOUR ORDER. Presented in a luxury gift box with matching ribbon & bow. We need the following information. 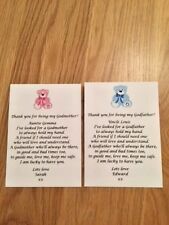 Disney Dumbo The Elephant Christening Baptism Newborn Baby A4 Print Only. Printed on premium 260gsm white A4 card, which gives crisp lines and bold colours that won't fade. (Size: A4 or any smaller size (by request). Paper: 1) White glossy photo paper 260 gsm (Matte back) - sent by default. - Any other text. 2) White matte paper 200 gsm. 3) Ivory/Cream paper 210 gsm. Baptism / Christening Card for an Adult. Wishing you Joy and happiness On the Special Occasion Of Your Baptism. Size: 19 x 11 cm. 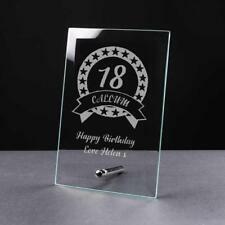 Made of 3mm Mirrored Acrylic which engraves with a white frosted finish. A beautiful handmade heart plaque for special godmothers or parents. Great for Girl or Boy's First Communion or Christening cake. This topper can be made in different colours, designs may be slightly different as they are allhandmade. Personalised Engraved Wine Glass with Gift Box. 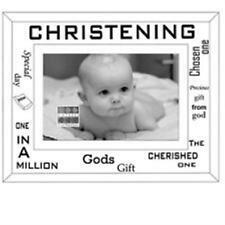 Christening, Baptism, Holy Communion etc. A beautiful wine glass perfectly finished with. The glass is engraved and will hold no colour. A beautiful New Baby personalised Jemima puddleduck print for the nursery with the initial of your choice. This print is A4 in size. Print will have the initial of choice. Great for Girl or Boy's First Communion or Christening cake. More toppers are always being listed. Print will have your initial. Personalised Engraved Pint Glass with Gift Box. 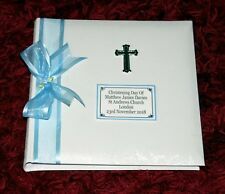 Christening, Baptism, Holy Communion etc. A beautiful pint glass perfectly finished with. The glass is engraved and will hold no colour. The print will have your initial choice. A beautiful Peter Rabbit personalised Christening print for the nursery with the initial of your choice. A guardian angel has been sent to you. To watch over and protect you always. 2 nd March 2015. Each keyring features a Godmother heart charm along with a silver fairy wand. 5, would you like Stickers included?.